Step out of Venice's station and take a turn to the left. 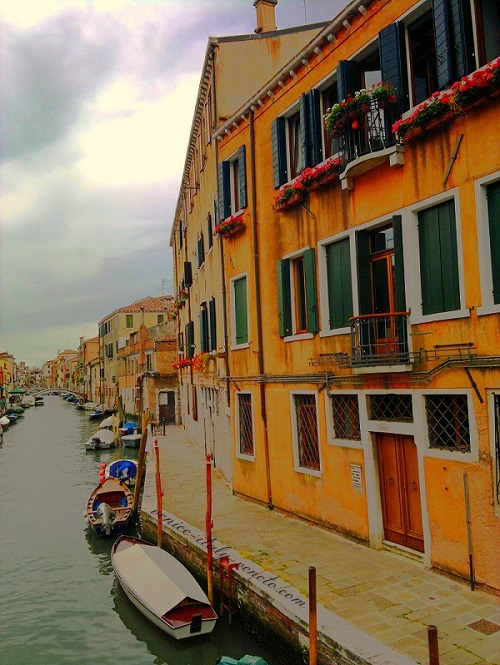 Walk from here towards the Rialto Bridge and you'll be passing through Cannaregio. Now most people do exactly that, they walk on in a desperate rush to get to the Rialto Bridge, cross into San Marco and explore touristy Venice. 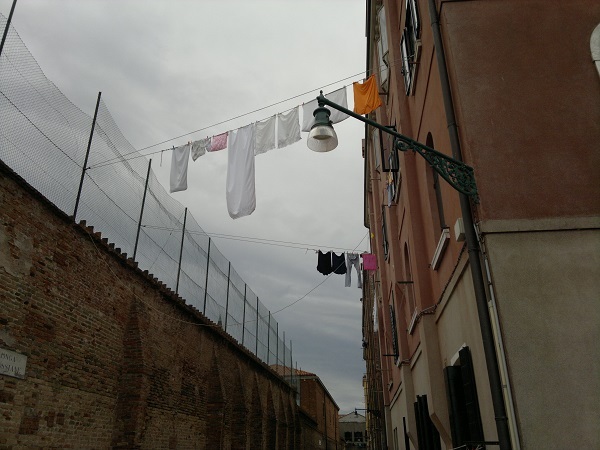 That really is a shame because Cannaregio (click for our guide) has a lot of secrets to share with you. 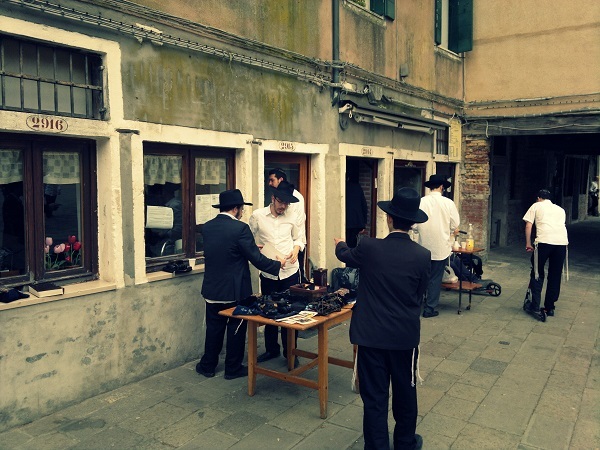 One of my favorite "secrets" is the Ghetto, the home of Jewish Venice. This area and the surrounding streets are fascinating and still have the feel of a small town with few tourists around and mostly locals going about their business. 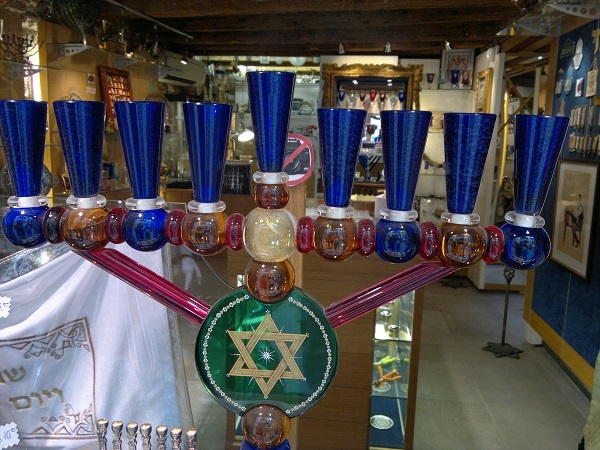 You'll find some interesting little shops too, unlike the shops in San Marco which are all filled with tourist souvenirs. Despite Time Magazine rating the ghetto so highly people fail to visit, they seem to think that only Jewish folk would be interested. That's a mistake, I'm Roman Catholic and love exploring here and you'll always feel welcome. 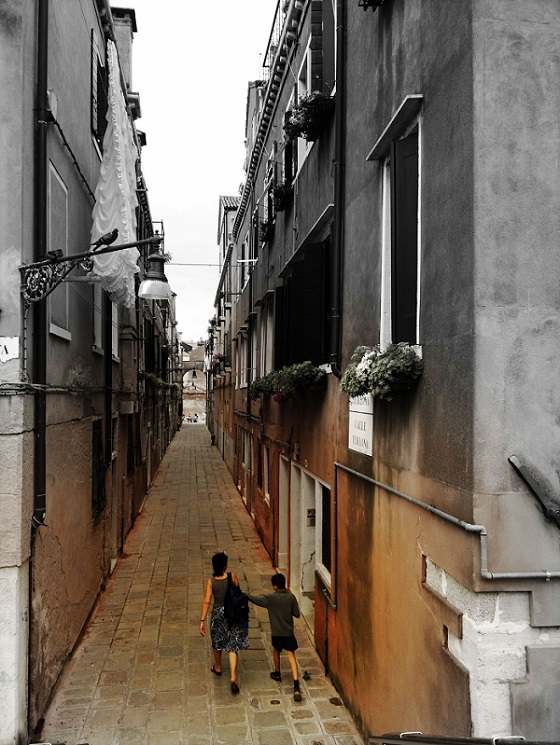 This is one of the friendliest parts of Venice, maybe because they don't see many tourists. Whatever the reason they'll always appreciate you showing an interest in their neighborhood. If you'd like to learn more about the history of the Ghetto then grab yourself a copy of the excellent Ghetto of Venice . 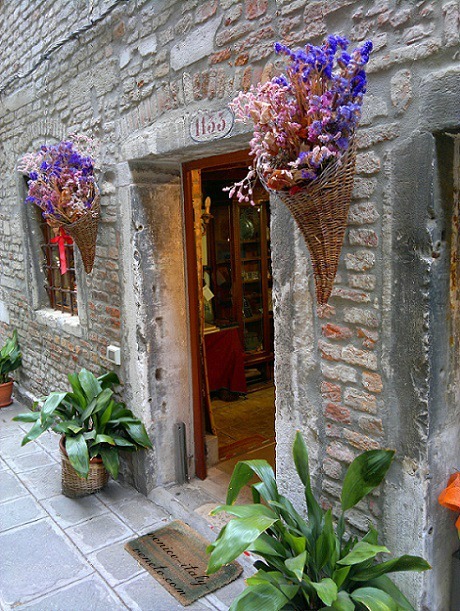 Cannaregio is one of the best places to stay in Venice as well, way more affordable than San Marco and with some great value authentic restaurants like La Vedova. Anyway San Marco is just a bridge, the Rialto Bridge, away. If you do decide to stay then how about a restored Monastery? It's a hotel now but it's still is packed full of charm and history - you can get all the details here. A little store that is just a short way before the Ghetto. Some of these little lanes are too lovely for words and often I seem to be the only person exploring - even in June and July. 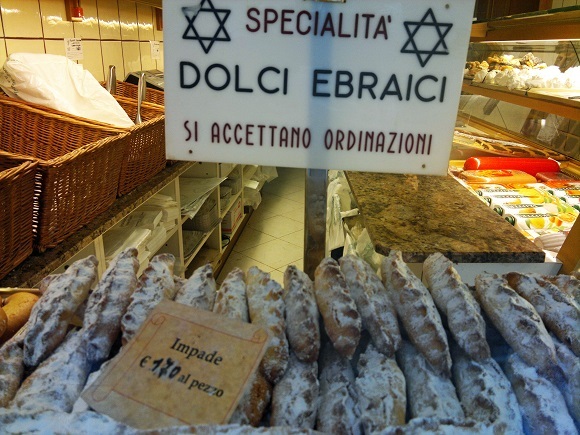 Around the ghetto there are many shops selling traditional Jewish foods. Most of the time I have no idea what I'm ordering but it is always delicious. This is right in the Ghetto and it is amazing how many of the cramped and tiny homes have been restored and transformed by the simple splash of color a flowerbox or two can bring. 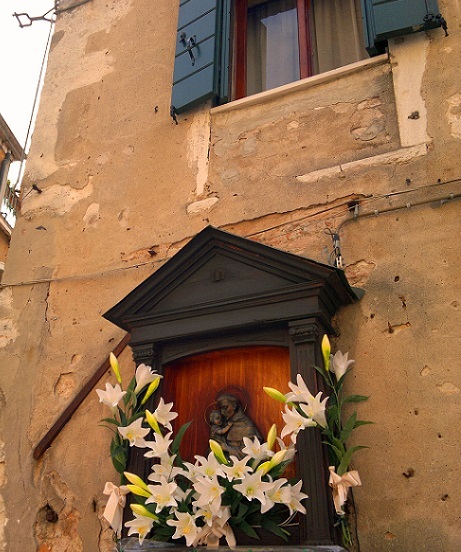 This was taken around ten minutes walk from the Ghetto in Cannaregio. 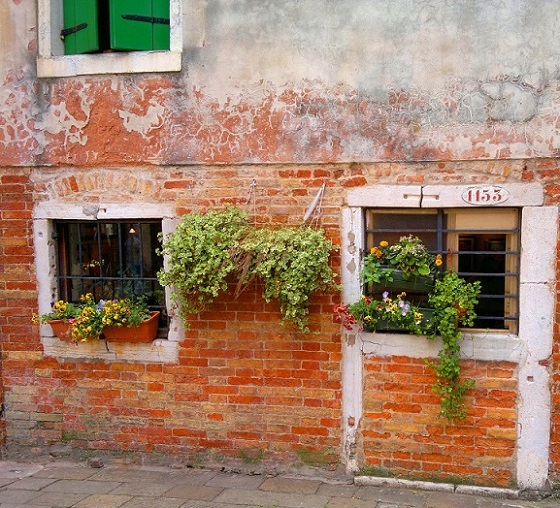 These narrow little streets are typical of the area. We were in a big rush to get to a shop and to get out of the rain, which started about two minutes after this photo was taken. Isn't this touching? I always find these so beautiful and this one is very near the station - just before the ghetto.